The ViVi Nova Clearomizer X6 1300mAh Battery Starter Kit is made up of the ViVi Nova Clearomizer and Kamry X6 1300mAh variable voltage battery. The ViVi Nova offers you clouds of vapor and wonderful flavor along with durability and longevity. This clearomizer, paired with the Kamry X6 1300mAh Variable Voltage Battery, will wow you with its power and the satisfaction you'll receive when you vape. The ViVi Nova has long been a favorite in the vaping world, and for good reason. It is a top filling, bottom rebuilding clearomizer that makes using and maintenance a breeze. The ViVi Nova can be rebuilt by replacing the coil heads (also known as wicks) that are screwed onto the base. Because the wicks are located halfway up the center tube, you need to make sure that they stay moistened at all times. It is recommended to roll the e-cigarette in your hand occasionally to make sure that the wicks remain moist. The X6 1300mAh battery will give you hours and hours of vaping with the added bonus of being a variable voltage battery. 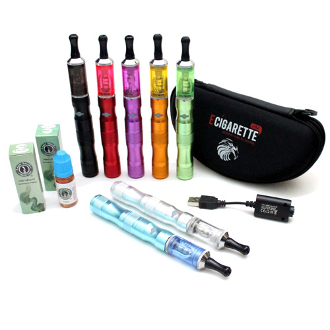 This gives you the capability to adjust the voltage to personalize your inhale. (Set the voltage higher for higher PG liquids and lower for higher VG liquids.) It is 510 threaded so it will work with your eGo Clearomizers. Click the button 5-times to turn the battery on. Press the button 5-more times to cycle through the voltages from Red to Purple to Blue. Press the button 5 more times to turn the battery off again. 5-click cycle: Battery Off, Red 3.6 volts, Purple 3.8 volts, Blue 4.2 volts, Battery Off. 1 - X6 1300mAh Variable Voltage Batteries. 1 - 10ml e Liquid. 1 - USB Charger With Cord. 1 - USB Home Charger. 1. Unscrew the silver metal top from the plastic tube. 2. Add your liquid down the inside, between the centrepiece and the plastic tube wall(DO NOT OVERFILL THE CLEAROMIZER). 3. Reattach the silver metal top. **As you are filling it you want to aim for 2.8 ml mark or just below it (quantity readout is on side of clearomizer tube). If you pass 2.8ml mark, you are over filling it. Over filling it leads to less smoke and you risk the chance of accidentally sucking the liquid out. 1. Remove your Vivi Nova from the battery and the remove the bottom silver metal piece of the clearomizer from the plastic tube. (Any liquid you have inside the clearomizer will be lost at this point in time). 2. After unscrewing the bottom of the clearomizer, all of the inside components will come out. 3. Now twist off the wick piece (it looks just like your replacement wick) and throw it away. 4. Then screw in your new replacement wick. 5. Insert the entire bottom piece back into the plastic clearomizer tube, making sure to thread in together properly. 6. Now fill with e-liquid, smoke and enjoy!